An unexpected side effect of me starting to actually use these models instead of merely painting and talking about them is that some Japanese are stealing my decidedly Sino-centric show. I suspect this latest acquisition is the second step down a road I was hoping never to walk down. So, what prompted me to take the first step? Well, ninjas bring a lot to an Imperial Service list that can’t be gotten elsewhere. After my first games with the service I found myself craving those things. First, TO Camo. I don’t think any other unit in the service can take the form of a marker. This also grants the second attribute, hidden deployment. In the entire Imperial Service, only the ninja and Garuda tacbot can start the game off the table. Third is infiltration, in the entire Imperial Service, only the ninja and Garuda can can come into the game ahead of the deployment zone. In summary, they have monopoly on all the tricks the Imperial Service have access to. So to plug this ninja shaped hole, I decided to buy a ninja. 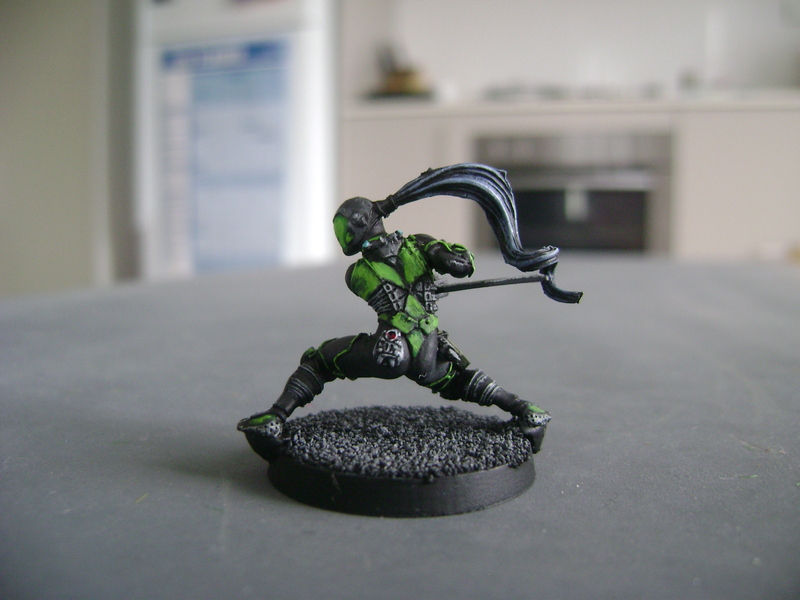 My first choice was this hacker, because it did not look too different from a normal ninja, and had no sculpted BS weapon so it could comfortably sub in as a Combi rifle or bow ninja. She was not on the shelf at the time I caved, so I instead grabbed the no less dangerous looking Oniwaban, whom I also admired, to be my various ninjas for much the same reasons. You can check out that article to learn more about the characters that are used to write Ninja. I have no regrets about that, even though when I was finally confronted with the chance to pick up the ninja hacker I did so without hesitation. I tend to use her as solely a hacker where as the Oniwaban model gets used as the a ninja with tactical bow. So here I am, sitting one one more ninja than the Imperial Service sectorial allows you to use at once. 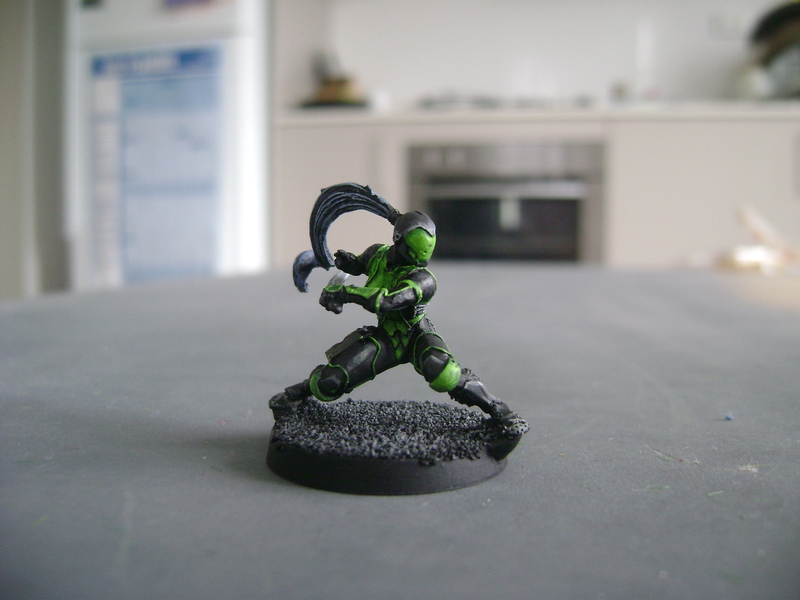 I fear when the Yu Jing starter pack is updated and I end up with it’s token Japanese Sectorial Army model as a by-product, I might be tempted to just “bring it up to 300 points”. Then there will be no saving me. 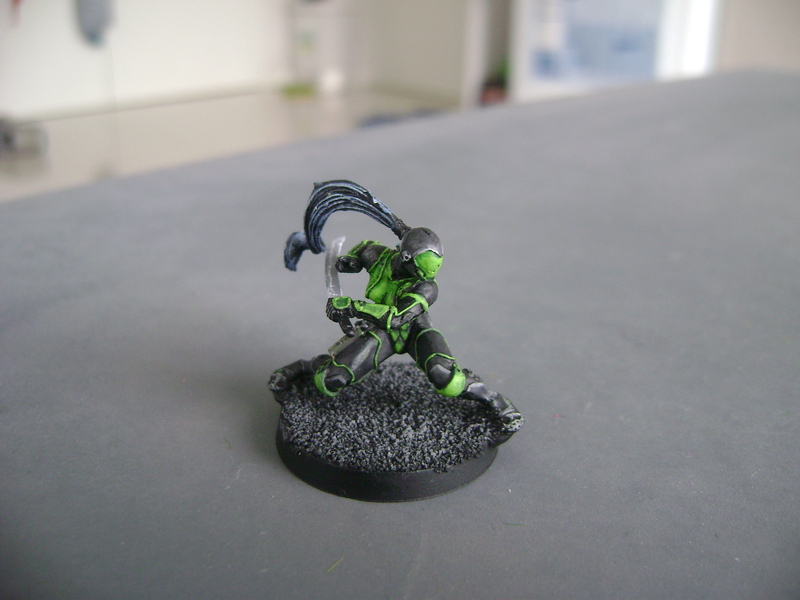 I painted the green areas starting with Games Workshop Snot green, then a layer of Scorpion green with slightly less coverage over the top. I did a little highlighting with Scorpion Green mixed with Sunburst Yellow but not much. On the breastplate, I used a little watered down Dark Angels Green to accentuate the contours. I think she turned out great. So great that I want to repeat the process on the Ninja sniper. God help me I want all the things. Really looking good. Love the green!